The predominant color palette of all the rooms in this big-city apartment is gray, white, and ivory hues. White marble, gray granite, pearlescent mosaics and brass maximize the feeling of nature while keeping the city look of the interior. 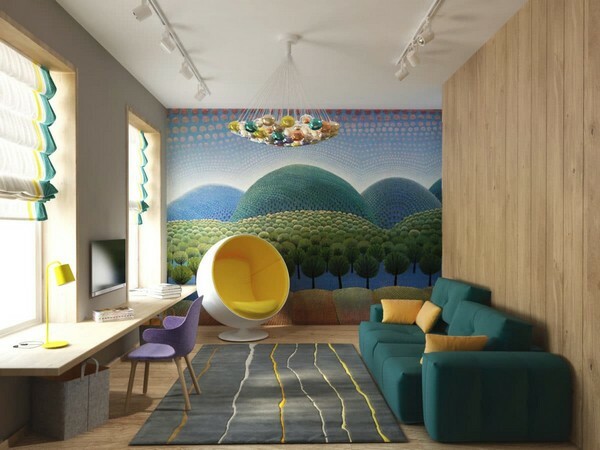 The only space with bright accents is toddler room – its wall painting is pretty fanciful and takes the kid to the wonderful world of dreams and fantasy. 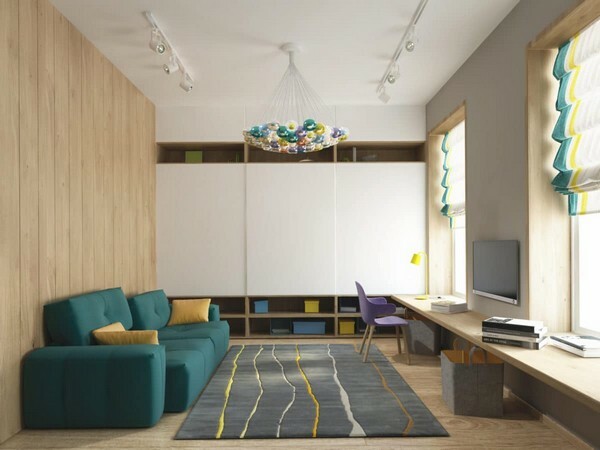 The owners, a young family with an 8-year-old kid, wanted their apartment to be minimalist and elegant at the same time, with a special emphasis on natural materials and colors. That is why the project features so much wood – oak and American walnut – on the floors and walls. The apartment is located on the top floor of an old building in Moscow and had a memory of the Khrushchev’s times – the so-called “winter refrigerator”. It’s a recess under the windowsill, which has an exit to outdoors. In 1950s the USSR couldn’t boast many domestic appliances and in the cold weather people kept their foodstuffs in such “refrigerators”. 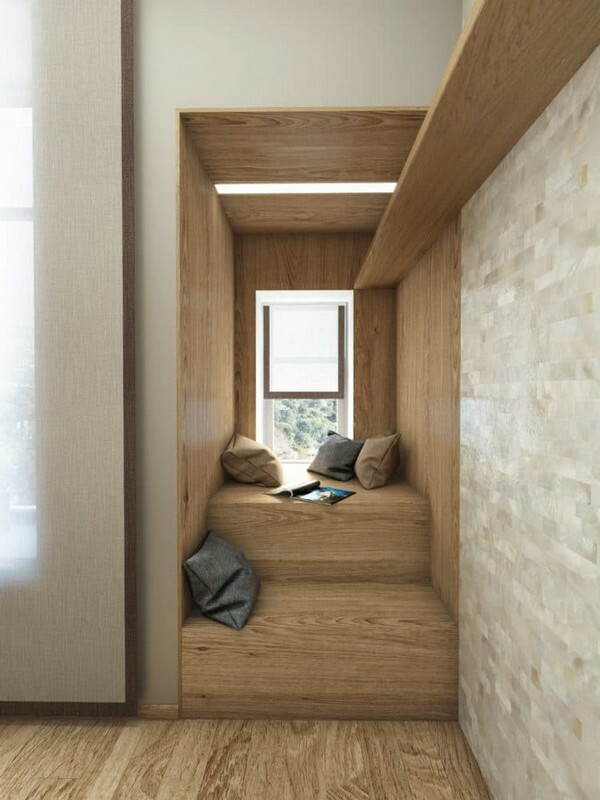 The designer turned it into a super cozy nook with wood stairs, which the owners especially love for warm family breakfasts and a splendid view. One more wish of the owners was a concealed system of kitchen utensils storage. That’s why the designers chose a Stealth Kitchen set: it’s an innovative modular design, which gets totally concealed behind wood doors. 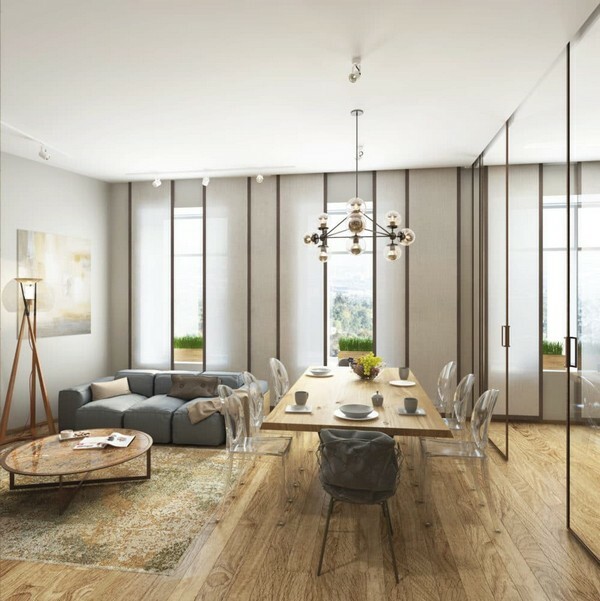 The open-concept living room plays the role of a dining room as well. Its centerpiece is a massive oak table by Cattelan Italia on a geometrical metal underframe. Matching them are Pina Low Chairs by Jaime Hayon with a metal net at the head of the table. To accent the geometry, the rest of the chairs are transparent, Louis Ghost by Kartell. A super low couch by Bonaldo is completed with the same-style coffee table by Draenert and a low arm-chair of fanciful shape by Carl Hansen. The bedroom is quite narrow, and to mask it the bed was made suspended, hanging on four cables. A blackberry arm-chair of exquisite shape, tall bedside mirrors and a vanishing pattern on the wall create the feeling of space expansion. In the playroom bright wall colors “travel” around the room: to the sofa upholstery by BoConcept, to decorative couch pillows and Ball Chair, and to the stripes of Roman blinds – and finally come together again in the multi-color glass chandelier by Bocci. The guest bathroom was intentionally made brutal and a little bit dull. 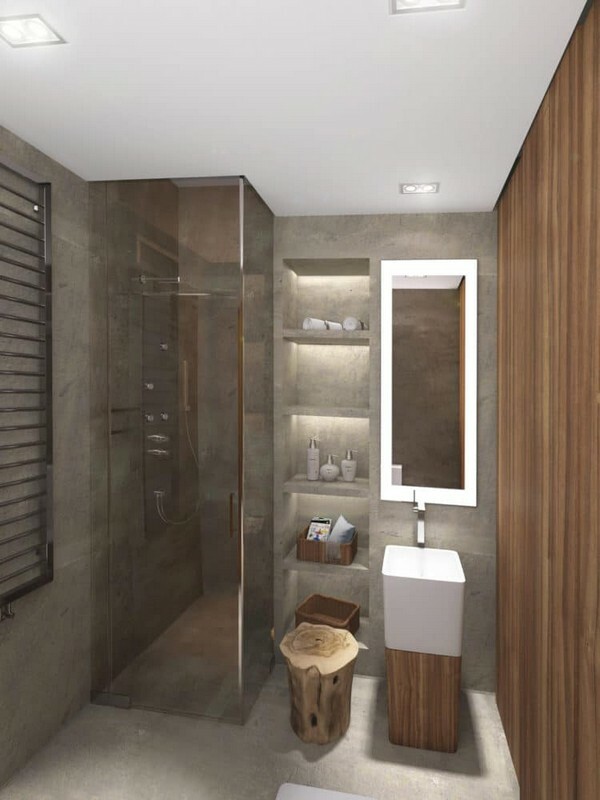 Its walls and floors are finished with a waterproof material Rezina by Gobbetto. A custom-made cabinet with wooden sliding doors adds warmth to the room and matches the basin cabinet by Neutra. The owners’ bathroom is by contrast very light and airy. 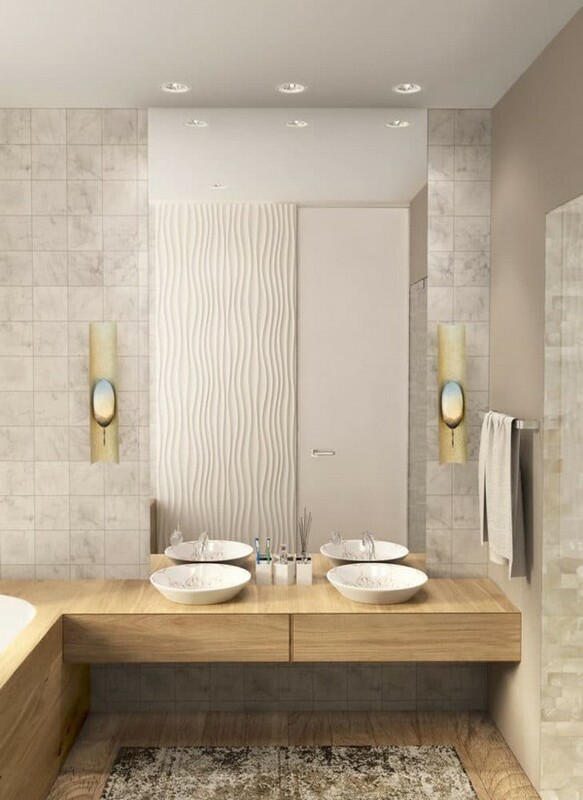 Wave-shaped 3D wall panels by Redlined, round basins by Kohler decorated with original Arabian paintings, a Turkish bath faced with beige mosaic tiles and white Carrara marble create light, soothing and elegant atmosphere. 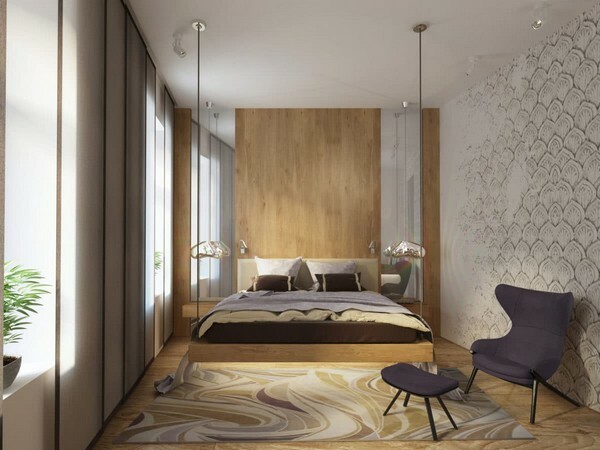 This interior project was quite complicated from technical point view, but the result appeared to be truly fascinating. 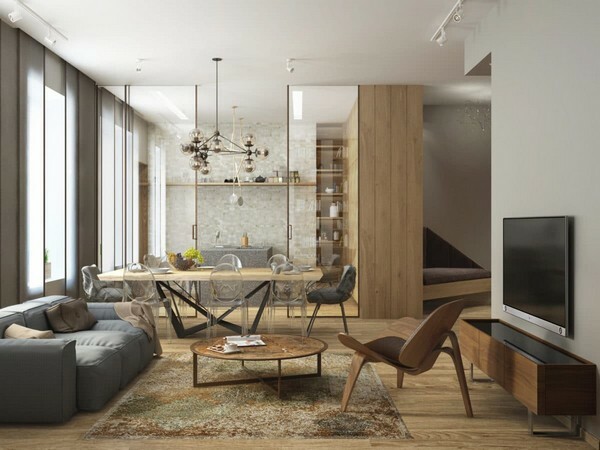 Plenty of natural textures, warmth of wood and designer approach created a natural and very comfortable urban interior.